Most of us are taught, from a young age, that in order to solve a problem, we simply need to break it down to its core components and solve for x. We learn science experiments that have an aim, method and outcome, a linear process from problem to solution. We are socialised to respond to reward and punishment and, by the time we have graduated from 15 to 20-plus years of institutionalised education, we have trained our brains to think in clear, ordered and, yes, very linear ways. If we want to overcome the systemic issues behind today’s problems, we need to change the thinking that led to them. The good news is that undoing linear and ridged thinking is pretty easy. Embracing a systems approach can help us evolve problems into solutions. Problems never exist in isolation; they are always surrounded by other problems.From the hypothesis-to-outcome structure of scientific investigations, through to the hyper-structured and inflexible departments of government , we have designed systems of silos that don’t connect to the bigger picture. These isolated systems create very linear perspectives of problems and limited approaches to solving them. If we really want to start to address the highly complex, often chaotic and incredibly urgent social and environmental issues at play in the world around us, we must overcome the reductionist perspective and build thinking and doing systems that work for all. A systems approach is an incredibly powerful tool for addressing problems. Thankfully, humans naturally have a curious and intuitive understanding of complex systems. So, it’s really not that hard to rewire our thinking codes from linear to expanded thinking. Systems thinking is a way of seeing the world as a series of interconnected and interdependent systems rather than lots of independent parts. It replaces the idea that a system can be understood by the sum of its isolated parts with the view that everything is part of a larger whole and that the connections between all elements are critical. Systems are essentially networks made up of nodes or agents that are linked in varied and diverse ways. What we want to do in systems thinking is be able to identify and understand these relationships. Every system is made up of many subsystems and is itself a part of larger systems. Just as we are made up of molecules made up of atoms made up subatomic particles, problems are made up of problems within problems. Every system is like a Matryoshka doll, with smaller and smaller parts within a larger whole. Seeing things in this way helps to create a more flexible view of the world and the way it works, and it illuminates opportunities for addressing some of its existing and evolving problem arenas. I describe this type of thinking as looking through the telescope to see the infinite possibilities of space, peering through the periscope to see the lay of the land with all its tangible connections, and looking back down to the microscope to get a refined view of the tiny parts that interconnect to make up the infinite whole. This is the foundations to a three-dimensional thinking practice that systems thinking enables. From climate change to racism and homelessness to global politics, taking a systems approach allows for a dynamic and intimate understanding of the elements and agents at play within the problem arena, enabling us to identify opportunities for intervention. One of the big hurdles people experience when starting to think through systems is that the possibilities of everything being interconnected creates a mental wormhole of potential possibilities. My solution to this is to construct a boundary around the investigation area to help define the arena in which one is exploring. Inside the scope are all the elements; outside of the scope are the other systems or elements that are identified but not included in the exploration. Think of it as learning to swim in a pool, with solid visible walls, versus the ocean, with infinite possibilities and no defined edges. Start in the swimming pool and the systems start to make sense. Eventually you upgrade to swimming in the ocean with ease. 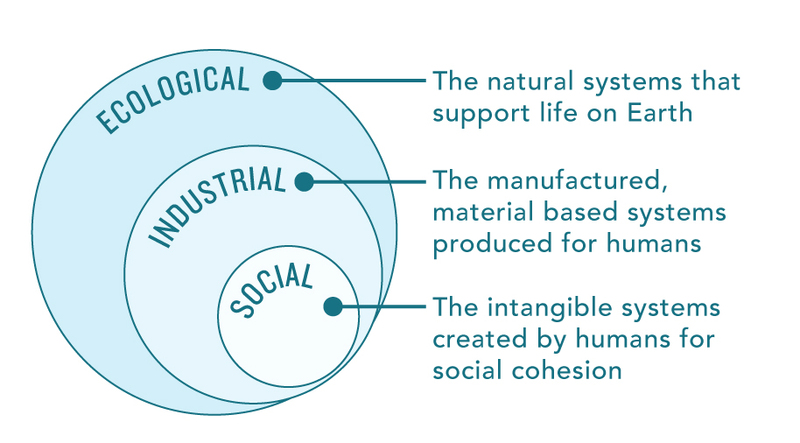 The world is made up of endless large and small interconnected systems, but there are three that are key to consider: social systems, industrial systems and the ecosystem. Social systems are the intangible rules and structures, created by humans, that keep society and all its norms and rituals functioning. Industrial systems are all of the manufactured material world, created to facilitate human needs and requiring natural resources to be extracted and transformed into stuff. The ecosystem provides all the natural services (such as clean air, food, fresh water, minerals and natural resources) needed for the other two systems to exist. These three big systems keep society in order, the economy churning along and the world functioning for us humans. Ultimately, approaching things from a systems perspective is about tackling big, messy real-world problems rather than isolating cause and effect down to a single point. In the latter case, “solutions” are often just Band-Aids (that may cause unintended consequences) as opposed to real and holistic systemic solutions. Looking for the links and relationships within the bigger picture helps identify the systemic causes and lends itself to innovative, more holistic ideas and solutions. Leyla Acaroglu is an award-winning designer, UNEP Champion of the Earth, social scientist and entrepreneur. This article is republished from Ensia.